Editor’s note: Marie Meis, a student intern at The Elgin Review, currently serves as president of the Elgin FFA Chapter. Here are her thoughts about the upcoming national observance of FFA Week. During the 1920’s, those in rural communities noticed a disinterest in agriculture and life on the farm and wanted to create a program that would show young people opportunities in agriculture and develop leaders in them. The organization Future Farmers of America was formed in 1928 and began to develop the many things it is now known for, such as the blue and yellow colors, corduroy jackets, and FFA creed throughout the late ‘2os and the ‘30s. The name Future Farmers of America was changed in 1988 to just FFA to show that agriculture reaches much farther just farmers. Throughout it’s many years, FFA has undergone many changes but it’s mission has stayed true, educate young people about the ever-growing industry of agriculture and show them how to be true leaders in whatever they may do. FFA has many focuses and it’s important to recognize all of them. The emphasises on career development has helped many students find their passion and thrive in future careers. This is done through competitions in a number of areas including livestock care/treatment, plant identification and management, ag mechanics, food science, and too many more to list. These competitions range from test taking to going out in the field to see for yourself. Some popular events in our Elgin FFA chapter include range judging, livestock judging, veterinarian science, floriculture and various ag mechanics competitions. Students have also competed in prepared public speeches, job interviews, or agriculture demonstrations, which are all done during our LSEs, or leadership skills events. FFA also has a strong focus in hands-on experience as shown through student’s supervised agriculture experience, or SAE. This area is about students working in the agriculture field to see for themselves what it’s like. Students from our chapter have had SAEs such as owning their own cattle herd, no matter how small; working at agriculture related business; or owning their own business, such as a lawn mowing service. SAEs help students get work experience and learn about money management. FFA has built a strong support and has continued to thrive throughout its many years and changes. National FFA Week hopes to recognize its long traditions and celebrate its new developments. 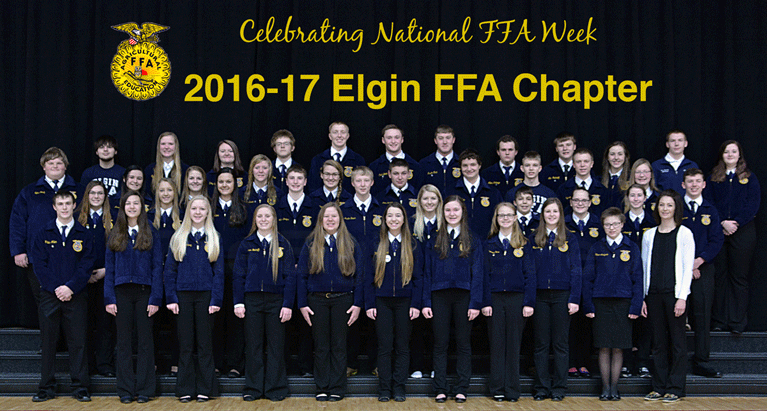 The Elgin FFA chapter has been able to thrive throughout these last fifty years because of its great supporters and great members. FFA is an organization that works for the students and helps them in whatever future career they may choose. Let’s hope for another 50 years of Elgin FFA!